If you look at coconut milk in the store, you will notice that pretty much every brand contains carrageenan. Even the organic brands. So the only other option is to make it yourself. The good news is that homemade coconut milk is so easy to do. It only takes a few minutes. 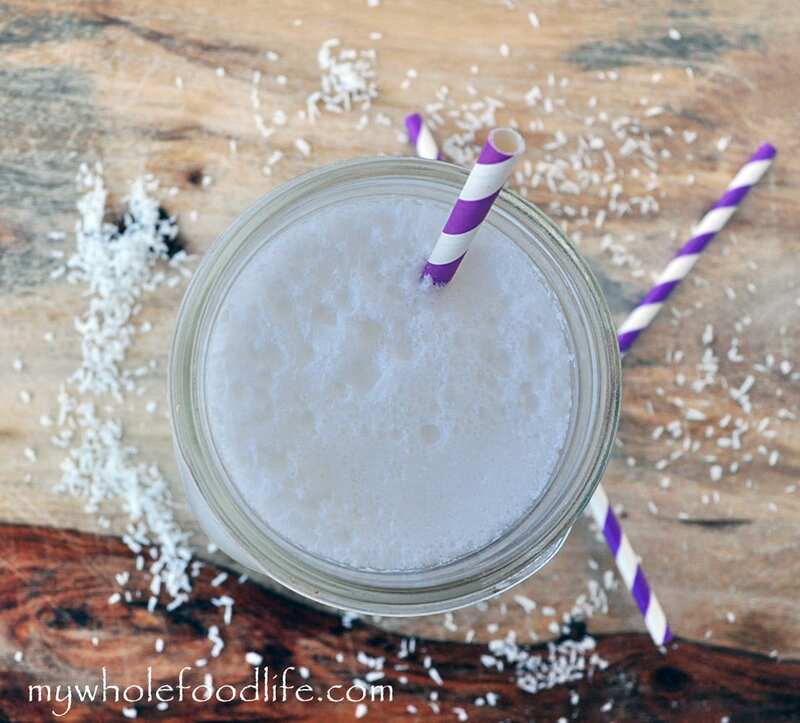 The best part about homemade coconut milk is that you can flavor it however you like. I like to add a couple dates for sweetness, but you can also add in some chocolate for a sweeter treat. 🙂 This homemade coconut milk would be great in my coconut vanilla chia pudding or my raspberry coconut smoothie. All you need is 3 ingredients. Only 2 if you want to omit the sweetener. So easy, you will never need store bought again! In a blender , combine the coconut and water and blend for 2 minutes. Set a fine mesh strainer on top of a bowl. Set a cheese cloth over the fine mesh strainer . Pour the blended mixture onto the cheesecloth . Once you see a lot of milk in the bowl, you can gather the cheesecloth up in your hands and squeeze the excess milk out. Keep squeezing until all the milk is in the bowl. If you would like to add vanilla or dates for sweetness, pour the coconut milk back in the blender with the dates and vanilla, and blend for 1-2 minutes. Pour into a jar. I like to use glass mason jars. The leftover "pulp" can be dried out and used as coconut flour. To dry out the pulp, set the oven to 200 and cook for 2 hours. Then blend into a fine powder. Store the pulp in the fridge. The coconut milk needs to be stored in the fridge. Use it within 3-4 days. NOTE: This coconut milk will not be able to replace the full fat canned coconut milk, but it can replace all boxed coconut milk. It's just not thick or rich enough to take the place of the canned coconut milk. This is such a great idea. It hadn't occurred to me to try making coconut milk this way. This is so easy! Thank you! Does this separate in the fridge like the canned Coconut milk does? Does it mix back together OK when you shake it? Yes it will separate a little since there are no additives. Any homemade milk usually needs to be shaken before using. You are so welcome Kathy! I made coconut milk once and it got solid in the fridge like the coconut oil. How do you get it to not get hard? I poured it through a nut milk bag. Afraid to try it again since I wasted that batch. How much water and coconut did you use? Maybe it was too little water? So glad it worked out for you! I've been thinking about making my own (due to the carrageenan in canned), but haven't gotten around to it yet. Seems just as easy as making almond milk! Can't wait to try--thanks! You're welcome! This coconut milk will not replace the canned coconut milk. :( It's not as thick and rich. It's perfect for chia pudding and overnight oats though! I need to try and find a homemade version for the canned coconut milk. I made coconut milk once and it got so hard in the fridge it wouldn't pour. Was the consistency of coconut oil! How do you keep it from turning hard and not pourable? I didn't have that problem. Were you mixing it with enough water? I don't remember where I got the recipe now. I will go ahead and try yours because all your recipes and so good and work! I will let you know how it turns out! Can I use a nut milk bag for this? Maybe I didn't strain it enough. Yes you can use a nut milk bag. I haven't tried that way, but I assume it works the same? Okay, I made it and it is in the fridge! I will see after it has been in there a while if it is hard as a rock! It was easy and looked good. Have the pulp in my dehydrator now! Can someone tell me the reason to avoid carrageenen? Thanks for sharing! I will check that one out for sure! Nice! Carrageenan is a problem in store bought milks. Drives me nuts! Why?????? Need to find time to make my own. I know, right? No need for that. So far, so good! I have had it in the fridge since I made it this morning and it isn't hard!! It was almost funny when I took out the batch I made a few months ago and it was so hard I think I almost bent the spoon! This recipe worked and I dehydrated the pulp and it worked, too! Thank you for being there with all these great recipes and tips!! hi there, i was just wondering if you consistently make everything homeade? and do you find it convienent and or do you find it cheaper than buying the coconut or almond milk in stores? I usually do almond milk homemade. Its pretty easy once you get the hang of it. using cheesecloth makes a big mess for me, is there any alternatives for me that i can pick up from a store? Maybe a nut milk bag? I am not sure where to get it though. I'm making coconut milk with fresh young coconut flesh from the coconut, Is the proportion the same as making it with dry coconut? Is it neccessary to strain if using a vitamix? I have never tried making it from fresh coconut, so I am not sure.